So what’s a girl to do with leftover mung beans? (Holy cow, a small amount dried turns into a huge amount of cooked mung beans!) 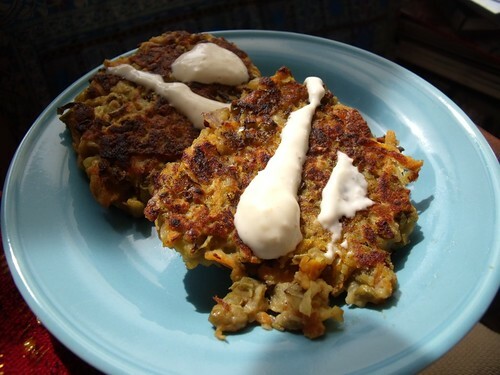 Why, make latkes of course! These would probably be better called fritters, patties, or even croquettes (like my White Bean, Parsley & Chive Croquettes! 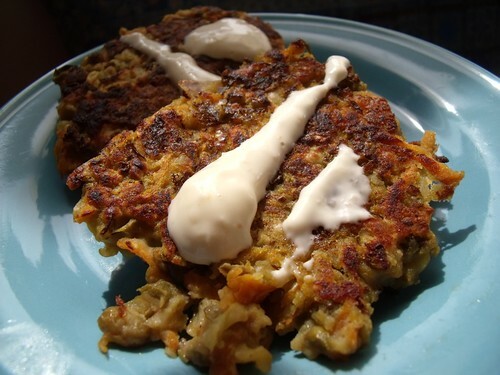 ), but the texture and smell reminds me of latkes, even though there are no potatoes in them! 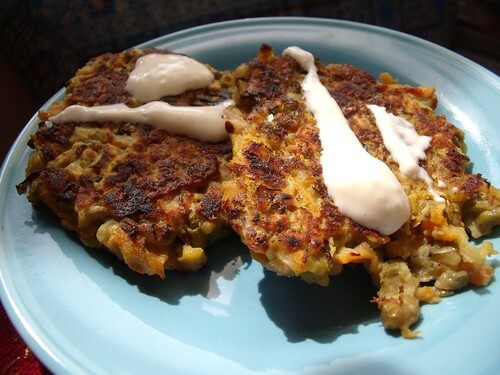 Bean patties/latkes/fritters are a great way to get your protein in while feeling like you’re getting a comfort food treat. And they’re an even better way to use up all the leftover bits in your fridge. You can blitz a whole bunch of extra (raw or cooked) veggies in your food processor or chop them up, add beans and an egg and mix well. Once they’re mixed, they’ll always be too wet, so add some breadcrumbs or flour until they’re the right consistency. 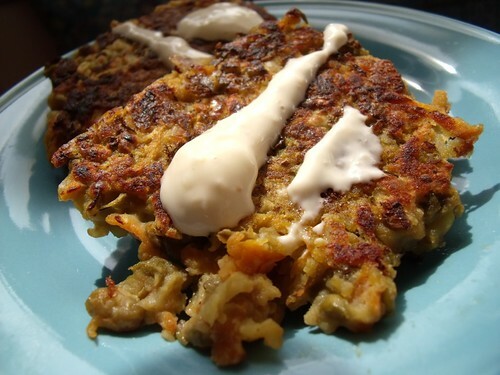 I used gluten-free chickpea flour in these latkes for a little extra protein boost and for the nutty flavour. It was a great way to go, and I’ll be doing that again. I hope I’ve opened up a world of patty possibilities for you! When I told my sister she could do this with leftover whole wheat couscous, she was amazed, and I could see her planning what else she could patti-fy. I’m expecting a whole set of baked veggie burgers from her made from different leftover grains and legumes! Red lentils and bulgur would be especially delicious — like in these Armenian Red Lentil Balls I can’t wait to try! When I cooked these up, I made a couple of ginormous ones and froze them. I’m saving them for a ‘veggie burger’ dinner when I am completely out of time one day and need something nutritious and delicious. I’ll let you know how they hold up, but I plan to put them in a pita pocket with a whole bunch of sprouts. The batch of latkes I made was probably enough for four people, so I had expected leftovers. But they were too good, and the boyfriend and I made short work of the whole lot! I blame the horseradish sauce. In a large bowl, combine all ingredients except the oil. Mix well to incorporate all ingredients. Heat about 2 tsp. of oil in a large non-stick pan over medium heat. Scoop out a golf-ball sized ball of latke mix, and press into a disc between your hands. Place as many latkes as will comfortably fit in your pan (about 4 fit nicely in my 22cm (9″) frying pan) — you want to leave enough room to make them easy to flip. Cook until the bottom side is a solid golden-brown latke (about 2 minutes), and flip to cook the other side for the same amount of time. Continue cooking the rest of the batter until you have a whole bunch of latkes, and serve warm with Arugula & Horseradish Sauce (it’s even great without the arugula!). Oh wow, I’m loving the new layout! Super neat, clean and pro! I feel a little sheepish in such a nice blog-establishment! And I love me some latkes. Scrum. And yes, latkes = yum. Definitely.